On April 3, President Trump donated his first-quarter salary — $78,333.32 — to the National Park Service. The money was meant for “the infrastructure on our nation’s battlefields,” Interior Secretary Ryan Zinke said. But battlefields account for just a fraction of the infrastructure problems plaguing the agency, and Trump would have to repeat his deed 153,192 times in order to cover the Park Service’s entire $12-billion backlog of postponed maintenance projects. It’s clearly going to take a much more substantial effort to bring that number down, especially as Trump has proposed a 12 percent cut to Interior’s budget. The recently introduced National Park Service Legacy Act would establish a fund to reduce the backlog over the next 30 years. The list includes buildings, roads and trails as well as water and wastewater systems. As park infrastructure ages, the problem grows: park units more than 40 years old account for the vast majority of assets in need, and units designated more than a century ago account for almost a third of the backlog. With the parks seeing record levels of visitation—331 million visits in 2016—their aging infrastructure is seeing more use than ever. 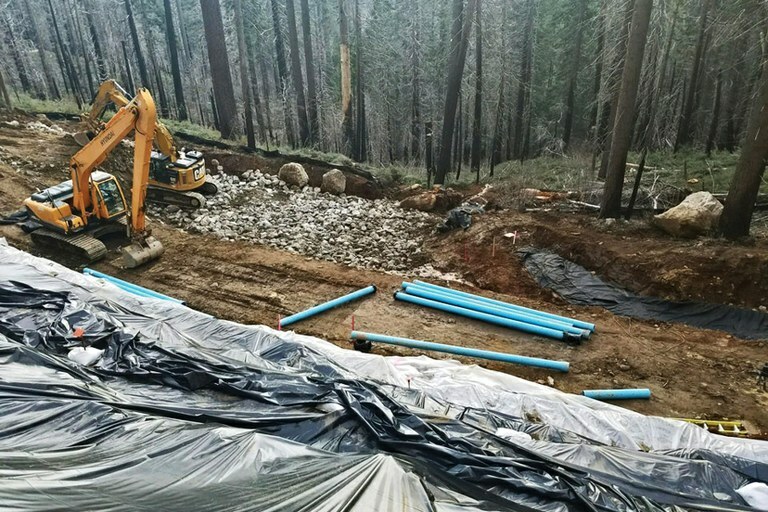 Big Oak Flat Road undergoes erosion repairs. It is the only paved route connecting Highway 120 to Yosemite National Park. 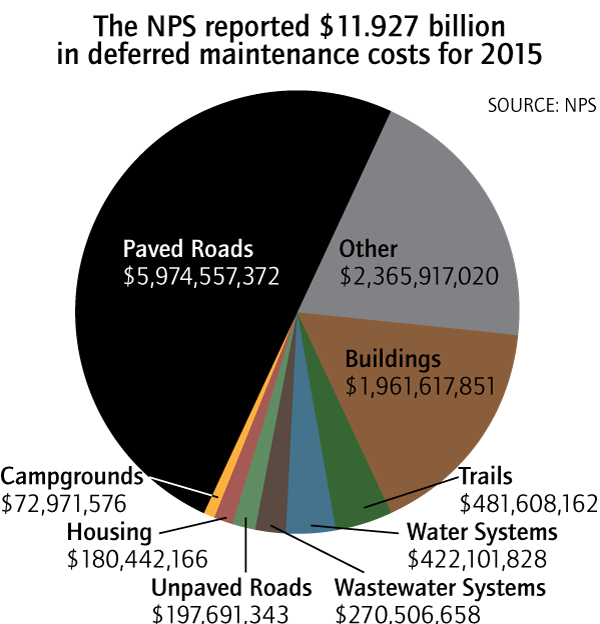 Paved roads are the highest deferred maintenance cost for the National Park Service as of 2015. The often-touted $12 billion figure makes for a striking statistic. During an oversight hearing by the House Committee on Natural Resources’ Federal Lands Subcommittee on March 16, attendees called the figure “staggering,” “embarrassing,” and “hard to get your mind around.” That overwhelming number drives home the extent of the problem, but it can also make finding a reasonable solution seem nearly impossible. And questions have arisen as to whether it’s a useful — or even accurate — measure. For instance, a recent Center for American Progress report called the backlog figure “bloated” because it lumps road costs in with the rest of the deficit. Funding for the park system’s tunnels, bridges and roads, which makes up half of the total backlog, comes from the Highway Trust Fund, not the Interior Department’s budget. Regardless, “they’re all legitimate backlog projects,” says John Garder, budget and appropriations director for the National Parks Conservation Association. The report also identified nearly $400 million in maintenance that the report says should be the responsibility of park concessionaires, such as $51 million for projects at the Majestic Yosemite Hotel (formerly known as the Ahwahnee). At the hearing, witnesses offered a range of suggestions, including many that the Park Service already uses, such as philanthropy, volunteer work, leasing to private entities and public/private partnerships. But these solutions only go so far — for one thing, outside gifts don’t tend to support maintenance. “There is no philanthropic appeal to projects such as wastewater treatment plants,” wrote Deny Galvin, National Park Conservation Association board member, in his testimony for the hearing. 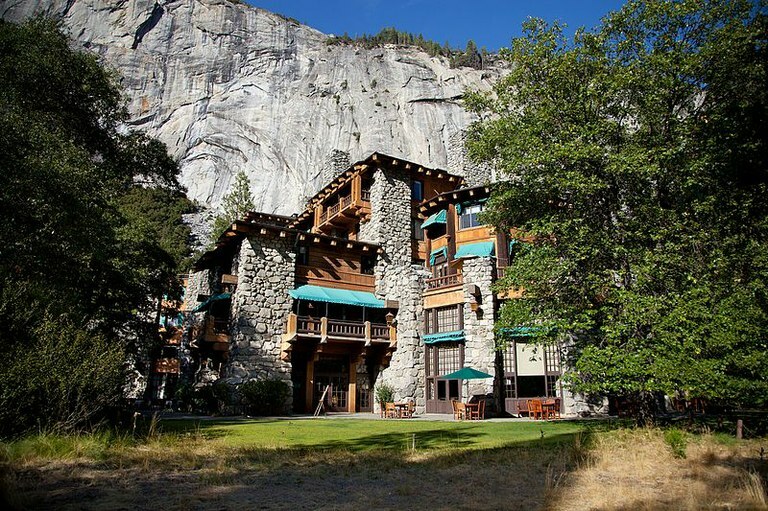 The historic Ahwahnee Hotel, recently renamed the Majestic Yosemite, accounts for $51 million of Yosemite National Park’s $555 million in deferred maintenance. But ultimately, “a substantial portion of the answer” will require a “sustained program” of appropriations from Congress, Galvin says. There’s a precedent for this: Mission 66, a $1 billion investment in park infrastructure between 1956 and 1966. But the National Park Service Legacy Act would work more gradually, incrementally increasing funds allocated from mineral revenue over the next 10 years, and gearing up to $500 million annually from 2027 to 2047. Introduced by Sens. Mark R. Warner, D-Virginia, and Rob Portman, R-Ohio, the bill seeks to address the projects the Park Service deems most critical, with 80 percent of funds going to historic sites and other repairs important to visitor access and safety, and 20 percent of the funds going to roads and other transportation projects.